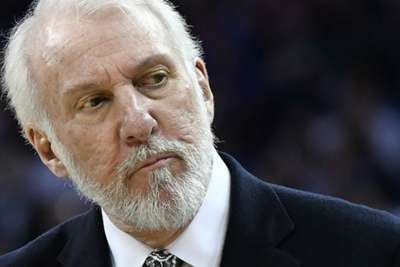 San Antonio Spurs coach Gregg Popovich will miss game three of their first-round playoff series against the Golden State Warriors on Thursday as he mourns the death of his wife. Assistant coach Ettore Messina will coach in Popovich's absence as the Spurs try to turn the series around after losing the first two encounters. The decision comes a day after the Spurs announced Popovich's wife, Erin, had died at the age of 67. "With deep regret the San Antonio Spurs announce that Erin Popovich, wife of Spurs coach Gregg Popovich, passed away earlier today," Spurs general manager RC Buford said in a statement.